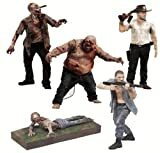 2012 Walking Dead McFarlane Bloody Zombie (3) Three Pack - Series (2) Two - Scarce!!! Hot!!! 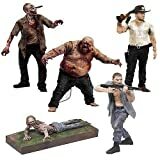 Robert Kirkman's hit comic, The Walking Dead brought to life on screen and in action figure form! Based off of fan-favorite characters in the AMC TV series! Interchangeable accessories and multiple points of articulation! Based off the AMC TV version of The Walking Dead, comes this Series 2 case of 12 individually packaged figures (subject to change): 3x Shane Walsh 3x Rick Grimes 2 2x Bicycle Girl Zombie 2x Well Zombie 2x RV Zombie The small-town sheriff's turned-hero and leader of the survivors during the zombie apocalypse, Rick continues to struggle with his moral convictions in season two. Rick is depicted in a brand-new sculpt in his civilian attire, prevalent in season two. Figure features interchangeable hands to hold multiple weapons, along with 14 points of articulation. Additional accessories include removable revolver, rifle with strap, and animal control stick for zombie catching. Rick's partner and 'loyal' friend, Shane was clearly the antagonist of season 2. Shane is featured in tactical attire with a shaved head and features a gun raising play-action, ready to pick off zombies with his single-barrel shotgun. The maimed zombie girl shown crawling next to her bicycle in a park turned out to be one of the most iconic zombies from season one. She is also the first zombie Deputy Rick Grimes encountered in the season one opener. 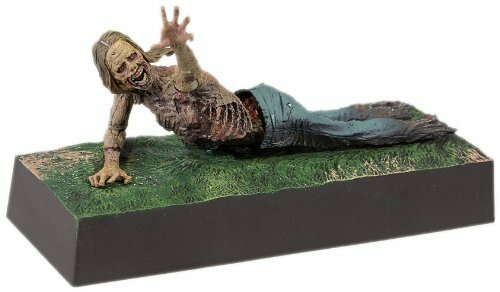 Figure features an eerie reaching motion play-action while lying on her base. Accessories include a damaged cell phone and jeans, as seen in webisodes. A rotten, bloated zombie surprise resting at the bottom of Hershel's water well that the survivors eventually attempt to hoist out by using Glen as bait. This is, by far, one of the sickest looking zombies seen yet on the series, and our figure is one dead on, stomach-churning replica. Figure includes 9 points of articulation with a pull-apart play-action that reveals his soft gooey guts inside!